Concrete is a basic mix of 3 materials: sand, stone and cement. 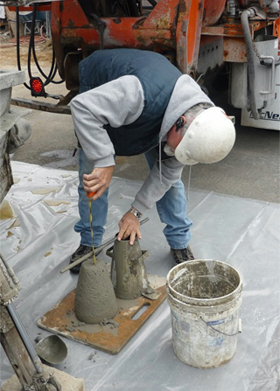 Although many companies are increasingly using different admixtures, we will talk about the 3 basic components of concrete. Recommended by the ACI (American Concrete Institute) concrete should not be placed at more than a 4 inch slump to maintain it’s comprehensive strength. In this part of the country they recommend a 4000 PSI mix. The more water added to the concrete will increase the chance of shrinkage, weakens the mix and increases the chance of cracking. AGRA Concrete has the qualified manpower both in numbers and experience to handle any size pour without over watering the concrete giving you a lasting project.